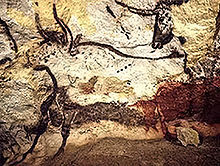 Aurochs on a cave painting in Lascaux, France. The history of art is the history of any activity or product made by humans in a visual form for aesthetical or communicative purposes, expressing ideas, emotions or, in general, a worldview. Asked to submit something for display by the Society of Independent Artists in New York [in 1917], Duchamp sent a urinal. Duchamp of course knew the history of art. He knew what had been achieved—how over the centuries art had been a powerful vehicle that called upon the highest development of the human creative vision and demanded exacting technical skill; and he knew that art had an awesome power to exalt the senses, the intellects, and the passions of those who experience it. Duchamp reflected on the history of art and decided to make a statement. The artist is a not great creator—Duchamp went shopping at a plumbing store. The artwork is not a special object—it was mass-produced in a factory. The experience of art is not exciting and ennobling—at best it is puzzling and mostly leaves one with a sense of distaste. But over and above that, Duchamp did not select just any ready-made object to display. In selecting the urinal, his message was clear: Art is something you piss on. There's a machine which is called History of Art, which is a structure. And artist fits in this only because he or she is needed for this structure. If for example the History of Art needs some parallel lines, there is an individual who makes parallel lines. And this individual fits into this machine which works by itself; it doesn't care about people or anything else, it just goes by itself.